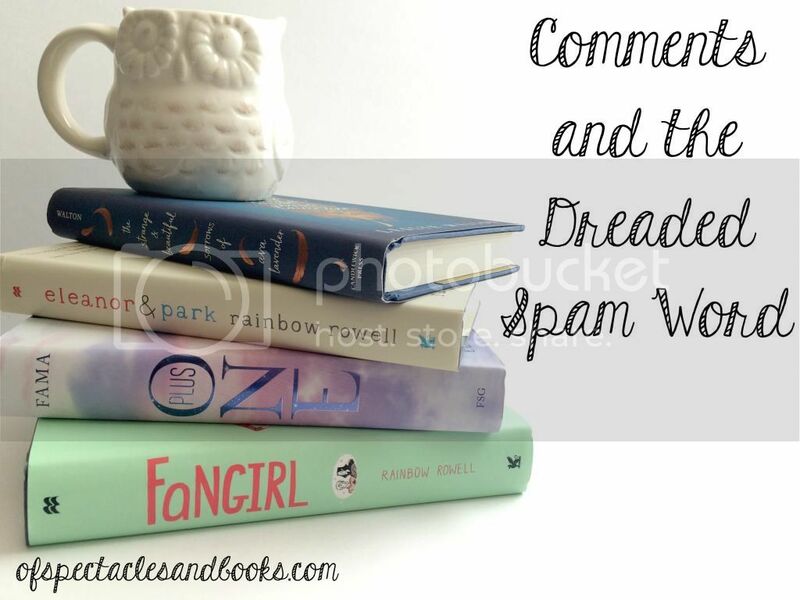 So as a blogger, we all love receiving comments from our readers, but what we don't like is spam. Spam is the bane of a blogger's existence for good reason. I feel like spam can take on many different forms. It can take on the normal "Click here for free RayBan sunglasses!" or it can take on a "Cool post! You should check out my latest post!" I think you know which one I'm going to talk about. And I'm mostly targeting this post to the young bloggers out there, because most of our seasoned bloggers know better than to do this. But I think if you comment, you should always leave worthy comments. Comments that invite discussion and response (much like what I talked about in this post a few weeks back). So I want to talk about when it is appropriate to link your blog or post in comments. In my opinion, as long as you write a comment that actually talks about the post, you can link to your similar post. I'm talking about memes like Top Ten Tuesday or something similar. I like when bloggers who comment on my TTT's leave a link to their posts because it's fun to see how creative or different people can be as far as tastes go. I think that's completely fine to add; however, I think you should make sure that you leave a comment that isn't just "cool post" or something similar. If you leave a comment like that, bloggers might consider that spam. And obviously, spam is a no-no. Some of you new bloggers or people who are HTML challenged (like me! It's okay, no shame!) may not even know how to put that at the end of a comment. All you have to do is copy and paste. Replace 'Amanda' with your name, the link with whatever link you want to use, and the 'Of Spectacles and Books' with the name of your blog. I hope this helps you guys in linking your blog in comments, and I hope this has given you newbies a few tips of the trade. What do you guys think about the etiquette of linking in comments? Linking your name at the end of a comment as a 'sign-off' is perfectly cool by me, or linking your post for a meme. It's the 'check out my blog: BLAHBLAH' or the 'I just followed you check out my blog' at the end of a very generic comment which is obviously a result of them not having read the post. Basically, yes, if you write a real comment, link your name. But don't write a basic 'cool post here's my blog' because that's just a bit rude. And people will ignore it. I usually add my name and a link to my blog in my comments for memes and for newer blogs I started following that don't know me yet, hoping to set up a relationship. I like when people add their name and link at the end of the comment so I can easily visit them back! I do however always prefer for a thoughtful comment over a generic one, but sometimes that can be hard to do on those meme posts so I don't hold people to it in that case because I still like seeing what they put for the topic that week. Great discussion post! Super good idea to share how to link in comments! I know how but it took me forever to figure out back when I started blogging. I agree with what you said. As long as the link is relevant and related to my post, feel free to link up! I also don't mind if you link your blog after your name (like Leigh @ Little Book Star) because I count that as your signature. What bothers me the most though are REAL spams. Those stupid ads that are obviously a spam. Those are just so annoying! I get plenty of real spam, though. Usually it's from someone named Anonymous who tells me (in broken English) that my blog is full of spelling errors, and that I need to go buy a fridge from them. Those get deleted, obviously. I'm pro-linking, but I HATE anything that vaguely resembles spam. Or blowing your own trumpet (I'm British. Humbleness is next to godliness here!). But as a small blogger, I do understand the desire to get your link out there and seen. For me personally, it often depends on which commenting system is used by the blogger that I want to talk to. If it's something like Discus or Comment Love, I know that I'm able to automatically leave my link, so I don't add it to the end of the comment - which I much prefer, as it feels more authentic to me. However, if the blogger is using google, I probably will add my link at the end, as my google account is still linked to my old Blogger profile (and I have no idea of how to unlink it, so there's a problem). There look. I've written you an essay on my commenting strategies. How much do you not care right now? I don't mind the [Name] @ [Blog] thing because sometimes when I try to check out a commenter's blog, their profile takes me to some shady google + page so the little sig at the bottom of the comment is actually helpful. I think this is my personal hatred, but I HATE when people do the "CHECK OUT MY RECENT POST: OBNOXIOUS LINK HERE" You can tell that they don't know how to code because it looks terrible. Plus, they're only trying to drive traffic to their post, which may or may not be irrelevant to whatever they're commenting on. That really drives me insane because I feel like they're commenting to get a comment back, rather than commenting because they have something to say. Did you get a million Ray Ban spam comments too? I literally had them on like twenty posts in one night, and it drove me nuts! I don't consider the general link to a blog at the bottom of a comment spam, as long as a meaningful comment is left, but if it's a link to a completely unrelated post, I do consider it spam. I think we've talked about this before, and how it bugs the crap out of me that people just pimp themselves out for no reason at all. Well, as a brand-spanking-new blogger (but longtime reader! ), it is quite possible that I've been doing the whole commenting thing all wrong. So this post was quite helpful to me. I get so freaking excited whenever I see the comment bubble light up on my blog, I can't even imagine what it's like to get spammed. By the way, I loved your interview on Downright Dystopian! I have WP and I have a plugin where it automatically leaves a link to the commentators latest post. I like that and doesn't bother me. I don't even mind when someone is like stop by my WOW or STS or something like that. But the 'Im having a giveaway, check it out!' with no mention of your content gets on my nerves! I think doing the name @ blog thing is fine as long as the comment has some substance. If a blogger leaves a well-thought comment and mentions he/she wrote a post on the topic at hand and leaves a link, that's fine, too. (I may even link to it in another post or something if I really like it.) But the "hey, cool post. Here's my link" thing is kind of irritating. It makes me wonder if people even read my post. If a blogger persists in doing that, I'll just delete the comment. UGHHH YES. I feel like this isn't even a blogging issue, it is just a "be a nice person" issue. Honestly, I cannot imagine just going to someone's blog, the post they've worked hard on, and saying nothing about their post and just "Great post, HERE'S MY STUFF FOLLOW ME". Seriously, do you really think I want to follow after that? No, I basically want to run as far away as possible. Because if you're doing that, you likely aren't really in it to meet people, to talk about books, to make connections, etc. Which is fine, do your thing, but I am not playing along. I just love this post. LOVE. I think the spam type comments of"check out my blog etc" is a rookie mistake almost every new bloggers makes. I know I did it a few times back in the day when I was a newbie. Lol so I try to cut folks slack when I see them having done that. This is fantastic advice - especially for newbies who may not know how to put a link at the end of their comment or who aren't really clear on the etiquette yet. We all kind of blunder around when we first get started! I always leave my link at the end of my posts, so people can find me! I have the html in a .txt file so I can easily grab it whenever I need it! I don't mind the signature at the end at all, or linking to memes (if the comment is on a meme post). The fulsome comments ("Wow, look at your amazing content!") followed by irrelevant links are so annoying though.